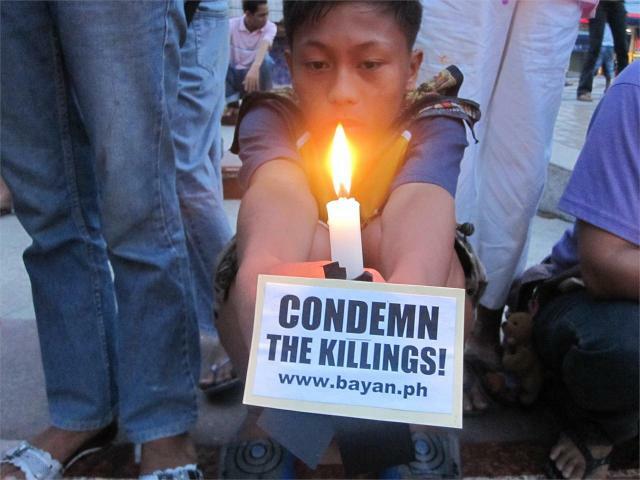 Today (Nov. 26), said Mrs. Arroyo, is a national day of mourning for at least 57 people – including women, human rights lawyers, and members of media – brutally massacred in a town called Ampatuan in Maguindanao province. Indeed, we should mourn. Not only for those killed in the mass slaughter of unarmed civilians that is unprecedented in the world’s recent history, at a time when democracy supposedly reigns, in a country that prides itself as a beacon of democracy. We should mourn the death of the rule of law and justice, the demise of decency and accountability in government that Malacañang has repeatedly and blatantly massacred with impunity. We should mourn the decay of our society where the police and military could not touch mass murdering warlords because their Commander-in-Chief has political debts to pay, including electoral victories clinched through fraud and terrorism waged by mass murdering warlords. We should indeed mourn when the police and military, without fear of retribution, kill, massacre, torture, abduct activists, lawyers, teachers, farmers, workers, priests, bishops, local government officials, government employees, women, children, students, human rights defenders, environmentalists, and anyone that the presidential mafia tags as its enemy. We should indeed mourn when the butchers who carry out these killings are promoted as generals and become makers of laws in a country where the law only applies to those without power, to the poor and oppressed, to those not in the mafia’s good graces. We mourn, and we rage. We rage against the impunity, the human rights atrocities, the cover-up, the fraud, the political patronage, the corruption, the injustice. We rage until we get justice for those killed by the Arroyo regime, and the Palparans, and the Ampatuans.